Well the time is nearly upon us. 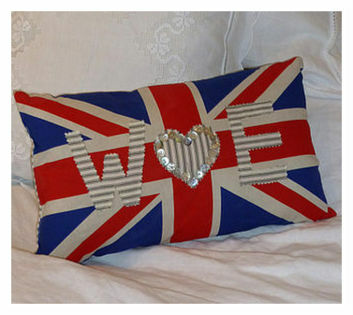 Our wonderful Queen Liz will soon celebrate her Diamond Jubilee and I for one would like to commemorate this by showcasing, over the next couple of weeks, lots of wonderful Jubilee and British themed home interiors. I’m not too interested in filling my home with bold union jack statements though as I do think I’ll tire of them very quickly so the items I’m hoping to show you should be just enough; little smatterings of Cool Brittania. So hold on to your hats for some fab accessories and products that you can use in the home to show your support for Great Britain. To kick us off I’m going to show a few bits that I’ve come across whilst doing some research for these posts. These are items I just love, that I’d have in my own home, that I’d recommend because I love the company, or that I’ve simply swooned over. And I haven’t been sent anything in exchange for the comments. It’s a fantastic Union Jack wall sticker clock, and it comes with it’s own working mechanism. How cool is that! I’ve used the Wall Stickers from Spin and they are so easy to apply, stay stuck on forever, but are easy to remove as well. It retails at £40 so it’s not too bad for price and I could live with this for a long time. Another fab item I came across a few days ago, which is cool and a little bit kitsch is this retro GPO Union Jack Limited Edition Push Button Phone available at QVC for an introductory price of £49.50. I love my technology but this style of phone takes me back to my childhood (oops that shows my age!) and it would look so cool in a study. I actually quite fancy this in my kitchen of all places. Designed by JoJo Accessories, this one can be personalised with a couple’s initials and would make a great wedding gift this summer. It retails for £26 including the letters, which I think isn’t bad at all. Don’t you just love ’em! Both available from John Lewis for £8.50. So, I hope you like my first offerings. Do keep coming back this week and next as I’ve got some fab little projects planned which I’ll be posting about and an amazing Wallpaper Wednesday competition lined up for later this week. But I want to leave you with this. At the weekend I attended Cybher, the all female blogging conference in London. It was an amazing day full of inspiring and information loaded workshops. At the end of the day I attended one run by the awesome ladies from In the Powder Room (well they were giving away free wine!) and joined in with their hilarious competition – a girly take on Bingo (enough said). Well blow me down if I wasn’t the winner! And what did I win? Well, here it is, an incredible set of nail varnish from Filthy Gorgeous all wrapped up in a fantastic Union Jack case worth £123! Do I like nail varnish – hell yeah. Please do pop back this week for some more Jubilee and Britain is Great home interior inspiration. reading this I was forced to crack open a box of Mr Kipling’s special edition, and exceedingly good, Great British Fancies! And I hope you managed to save some! It is so cool isn’t it! Love it too.